A typical solar system comprises a solar panel collector mounted usually on a roof. This then heats the water in the cylinder indirectly through a coil at the bottom of a cylinder. The sealed system is pressurised the water has glycol added to prevent freezing and has an expansion vessel, pressure relief valve, pump and controller. Whenever the collectors are hotter than the cylinder, the controller switches on the system’s circulating pump. 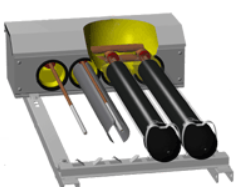 A mixture of antifreeze and water is then circulated through the collectors and the cylinder’s heat exchanger, heating the cylinder in just the same way as a central heating boiler. There are two different types of solar collectors; flat plate and evacuated tubes. Evacuated tube systems occupy a smaller area but are generally more expensive. High efficiency Flat plate systems have an efficiency close to the evacuated tube types and are generally cheaper but they are heavy to handle larger footprint on the roof and can cost more to install due to the physical installation requirements..
A twin coil hot water cylinder with 160 litre capacity. This provides a similar amount of hot water as a conventional 120 litre single coil hot water cylinder. Solar heated water circulates through the bottom coil, with the top coil used for topping up the heat using your existing gas or oil fired boiler. space is also left for an electric immersion heater to be installed. The cylinder is heavily lagged with twice the normal thickness of foam insulation (100mm insulation thickness) Tall and thin cylinders are recommended for solar heating applications because temperature gradients within the tank (stratification) optimise efficient transfer of the sun’s energy to the water. The choice of which solar controller to use will depend upon the type of system. 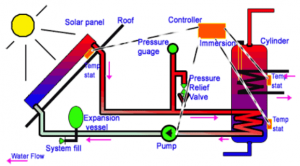 The controller will typically need wiring to two sensors (one on the solar panel, and one on the solar store or adjoining pipe work), to the solar pump, and to the mains electrical supply. 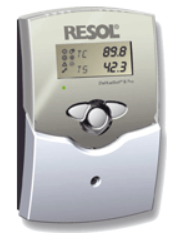 Pre-assembled controls packs, such as Resols controller unit, these give a much more professional finish to the installation and allow the user to fully monitor their solar systems performance. The pump, pipe, valves and devices that connect everything together and ensure the system works reliably year after year. All our systems include pressure, temperature and flow instrumentation so you can see if the system is functioning properly. This is complete in a compact and insulated housing.